Yay, no more field work! 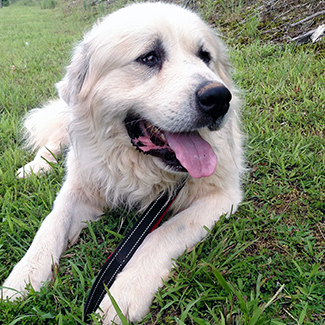 I’m Samson N., I’m 3.5 years old, 108 lbs, and I am celebrating my first days as a non-working Pyr. Don’t get me wrong, I’m not lazy, I just prefer hanging out with people instead of goats, air conditioning instead of wind, and carpet to grass. For you dental purists, my teeth are in pretty good shape, too; only moderate tarter according to GPRA’s vet. I hope you’re impressed, it’s not easy holding a toothbrush with my giant Pyr paws. Just kidding, I can’t clean my teeth so that’s one more reason I’m need a loving, patient, experienced dog family to help me learn all about being the indoor dog I’ve always wanted to be. And if you’ve always wanted to be a big-dog person, please email info@greatpyratlanta.com or click the “Apply to Adopt” button below to find out if I’m your guy.